While the trailer of director Shankar's 'I' starring Vikram and Amy Jackson in the lead has left the audience spell bound, most of the fans are in awe of the visual effects of the film. The VFX of a bike turning in to Amy Jackson was most talked about the during the teaser release a few months ago. 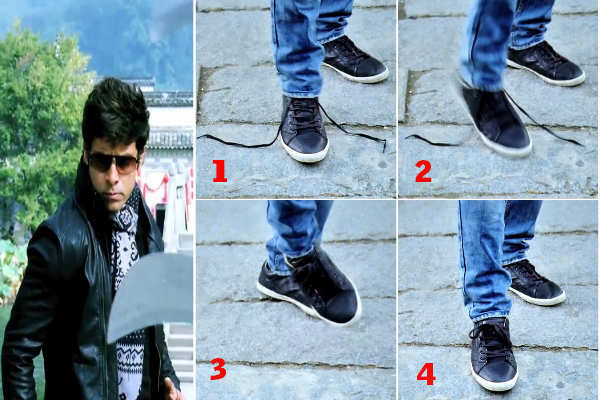 Now in the trailer, the fans are fascinated by the ace director using visual effects even for the scene where Vikram ties his shoelace without even touching it in a fight sequence that was shot in China. While most think it's a VFX, the truth is that it's a trick that even the director has revealed when quizzed by a fan, but called it a secret. We reveal you the secret behind the trick shot in the film. It is believed that magician Jay Noblezada invented the trick which was performed by David Blaine on TV in his Drowned Alive Special. This trick requires a little preparation but is well worth it. You will need a fake shoelace which should, partly covered by your trousers, create an impression of your shoelaces being untied. You should be able to quickly hide the fake shoelace from the eyes of the audience. You can achieve that by tying a thread to the centre of the shoelace. Just place the thread down your trouser leg. You then hold the other end of the thread in your hand and pull it when you want to hide the fake shoelace. The real shoelaces are tied the whole time, but hidden behind your trouser leg. You uncover them by shaking your leg. So, when performing this trick, just start shaking your leg, pull up the fake shoelace and be sure to make the real shoelaces visible.